Cannabis is now legal… what does that mean for beer? Another year, another thought experiment into what some of the emerging trends will be had in the beer industry! Will there be a resurgence of a particularly overlooked style of beer? Would some hot flashy new sour hit the market? The mind reels. But one trend that does seem rather unavoidable for the future is the beer world’s budding relationship with the cannabis industry. That’s right, cannabis, also known as marijuana, weed, the devil’s lettuce, mary jane, and of course reefer, has been captivating the interest of drinks companies long before legalization throughout Canada in October 17th of last year. For instance, Molson-Coors announced that it would be releasing a cannabis-infused beer in the next year. And one of the most notable deals is from Constellation Brands, renowned drinks producers and marketers that represent beer brands such as Corona, Modelo, and Ballast Point. The drinks giant took the risk of investing early on in cannabis producers Canopy Growth in 2017 and has since dropped billions into them, betting on what may turn out to be a very prosperous future. However, on a fairly smaller scale, craft breweries are also smelling the distinctive smoke of opportunity coming from the cannabis industry and seeing where they might fit in. And to be honest, everything seems very up in the air right now, mostly filled with announcements of potential plans. Popular Canadian brewery Steam Whistle told BNN Bloomberg in November that they were “engaged in active discussions” with cannabis producers throughout the country for a potential investment or joint venture opportunity. Many breweries are currently doing the same, engaging in the thought experiment of what form a relationship with cannabis may take. Others are a bit more certain and feel that the wave of the future is cannabis beer, which at the moment has a loose definition to it. Some breweries might mean a beer that incorporates the cannabis plant in the grains but with all the psychoactive properties removed. Others, like Province Brands who partnered with Toronto-based Lost Craft Beer among others, mean to make a non-alcoholic beer brewed entirely with cannabis and no grains, Others also include a beer with THC/CBD infused into the drink. Some drinks seem to go from interesting and curious to something more in line with a cannabis-infused carbonated water, but all might at least may have a good boost in sales when released. If pressed for a prediction on where this will all go, I’m afraid it’s too early to tell at the moment. Right now we have a bold new industry with a guaranteed chance of growth and so many people are smelling the money and letting their early adopter enthusiasm beat out the need for a solid plan. 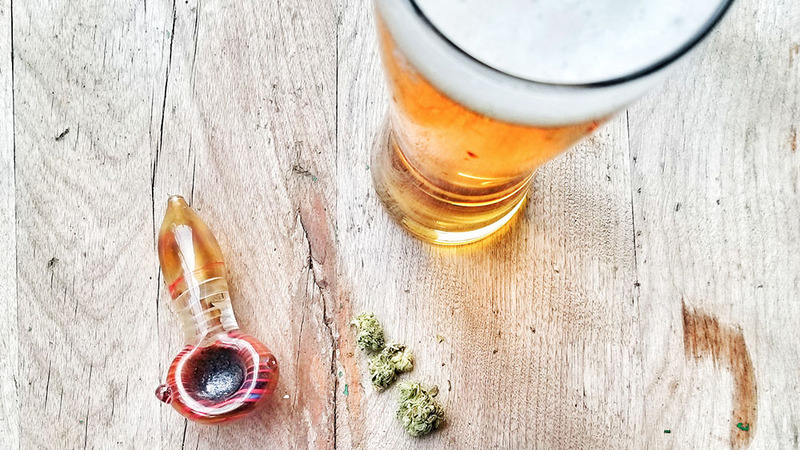 While I do see amazing potential in beer and cannabis pairings, specially branded strains for breweries, and especially THC/CBD-infused non-beer drinks, cannabis’ role in beer remains hazy. We’ll just have to pause, have a beer or maybe light a joint, and see where the trip takes us.